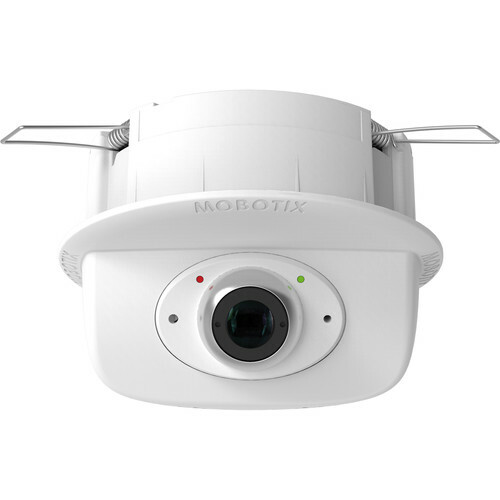 The p26 6MP Network Camera with Night Sensor Module (No Lens) from MOBOTIX is designed to be mounted onto a wall. Its 6MP 1.1/8" progressive scan CMOS sensor captures up to 3072 x 2048 resolution video at 12 fps. The camera's built-in temperature sensor, illumination sensor, movement sensor, and MxActivitySensor all trigger an alarm for event management. The camera features an RJ45 Ethernet connection with PoE for quick installation, while the included 4GB microSD card provides local storage. This camera operates with built-in firmware allowing remote access from Windows and Mac computers via a web browser, or using the free MOBOTIX app for iOS devices.